Household air pollution (HAP) is one of the most important global environmental and public health issues. As a result of changes in air composition due to rapid industrialization and urbanization, air quality is deteriorating and outdoor pollution is increasing daily. Simultaneously, poor ventilation, microbial growth, tobacco smoke, solid fuel use, and different toxic chemicals are causing deterioration in household air quality, which contributes significantly to the global burden of disease. This paper reviews the available literature to examine the impact of HAP on human health, comprehensively identifies the sources of HAP, and synthesize management approaches to reducing the severity of HAP. The English language databases PubMed, Google Scholar, Web of Science, and Science Direct were searched using the key terms: HAP, particulate matter, health risks, public health, pollutant sources, burden of diseases, and management approach. Bibliographies of all relevant articles were also screened to find further useful articles. This review addresses all possible sources of HAP that are categorized as biological or chemical (organic and inorganic) and are associated with grave public health threats, such as lung function reduction, respiratory illness, asthma, pneumonia, tuberculosis, eye diseases, pregnancy complications, cardiovascular diseases, and cancer. Suggested approaches, including compliance with international guidelines and regulatory frameworks, pollutant source reduction methods, and fulfillment of international environmental laws, conventions, agreements, protocols, and treaties, can be effectively adopted to mitigate household air pollutants, reduce the global burden of disease, and promote household environments that support better human health. The sources of HAP and its health impacts should be considered in the development of future policies concerning reduction in all household air pollutants worldwide. Therefore, this review establishes the groundwork for future studies assessing the effectiveness of strategies aimed at creating sound household environments to promote better human health. Fahad Ahmed and Sahadat Hossain are joint first authors, and they have contributed equally to this work. Daily life has altered dramatically over the last four decades, especially in industrialized countries, and this trend of changing lifestyles is only accelerating. Because of increasing demands on their time, high rates of urbanization, technological developments, and specific occupational functions, people are spending long periods of time households (i.e., in houses, offices, public transportation, schools, and shopping centers), and this is significantly influencing human life . Therefore, household air pollution (HAP) is responsible for a variety of health and atmospheric problems that have asymmetric effects on public health, especially for women and children around the world [2, 3]. As a result, household air quality is an emerging issue of great public health concern, as the prevalence of sick building syndrome (SBS), building-related illness, and multiple chemical sensitivity (MCS) has increased in recent decades [4, 5]. The World Health Organization (WHO) has reported that in 2016, nearly 8% (3.8 million) of premature deaths around the world were related to HAP . Most of the deaths occurred in low- and middle-income countries (LMIC), with 1.5 million deaths in the Southeast Asia, 1.2 million in the Western Pacific region, 739,000 in the African region, 212,000 in the Eastern Mediterranean region, 82,000 in the USA, and 52,000 in the Europe. Additionally, 9000 people in the high-income countries died because of HAP. Although LMIC carries the major burden of death because of HAP, such deaths are increasing day by day in developed countries as well due to people’s tendency to spend more time in the household environment exposing them to household air pollutants . Epidemiological studies have found strong correlations between exposure to HAP and low birth weight, preterm birth, and stillbirth [8, 9], neonatal mortality , nutritional deficiencies , asthma, chronic bronchitis and the most common form of chronic obstructive pulmonary disease [12, 13], tuberculosis , lung cancer, pharyngeal and laryngeal cancer [15, 16], cardiovascular diseases [17, 18], cataracts [19, 20], and otitis media . Sources of HAP are numerous and can be biological, chemical or physical in nature. Solid fuels (e.g., coal, biomass, and animal dung) are the leading sources of HAP; these fuels are used by 41% of households and approximately half of the world’s population as their principal household fuel for cooking, heating, and lighting [22, 23]. The use of these solid fuels has become a major public health problem and is attracting great attention. Indeed, household use of solid fuels was calculated to be one of the top five major risk factors for global disease in 2010 (4.3% of global disability-adjusted life-years (DALYs), 95% confidence interval (CI) = 3.4–5.3%), after tobacco smoking , causing 3.9 million premature deaths . If we focus on HAP caused by the use of biomass fuels, we can identify a number of health threats that are strongly responsible for respiratory tract infections, the potency of inflammatory lung conditions, cardiac problems, stroke, eye disease, tuberculosis (TB), and cancer. Moreover, when collecting firewood to use as fuel, women and girls are threatened by numerous indirect health effects, not only because they carry large bundles of wood on their heads and necks but also because they must travel far from home, which carries risks such as assault, insects (which are disease vectors), snake bites, absence from school or other learning opportunities, and musculoskeletal injuries . 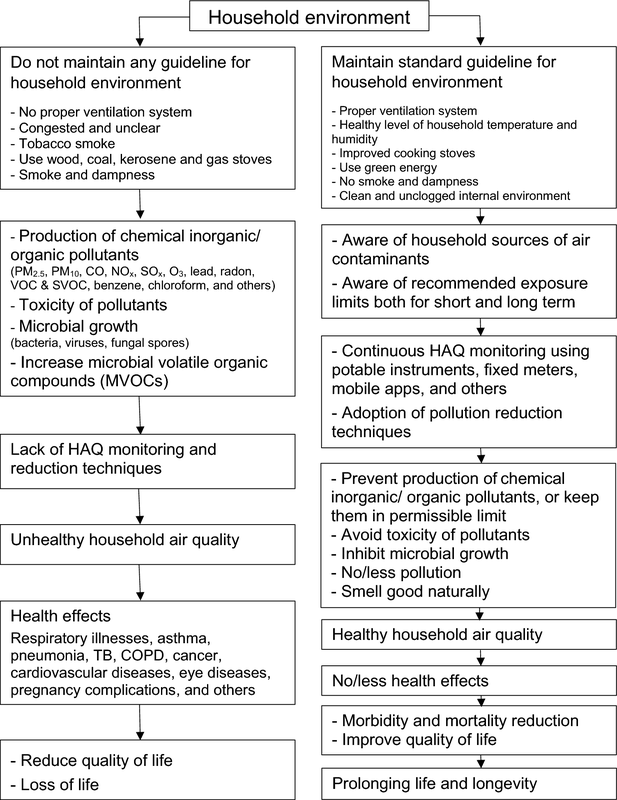 This paper reviews the types and sources of household air pollutants and their detrimental consequences for human health. It aims to provide a firm foundation for advancing knowledge of HAP as a global health concern. Finally, we conducted an empirical viability study on management approaches to source reduction in household air pollutants using different strategies. The main goals of this literature review were to document the effects of household air pollutants on human health, report the sources of HAP, and state the management approaches to reducing it. For this review work, quite an extensive range of literature was studied. The literature included peer-reviewed journals, conference proceedings, available books, and reports on Internet. The study was led in a four-stage cycle of identification, accumulation, categorization, and analyzation. The first step was the identification of the main keywords. Main keywords were household air pollution, particulate matter, health risks, public health, pollutant sources, burden of diseases, and management approach. 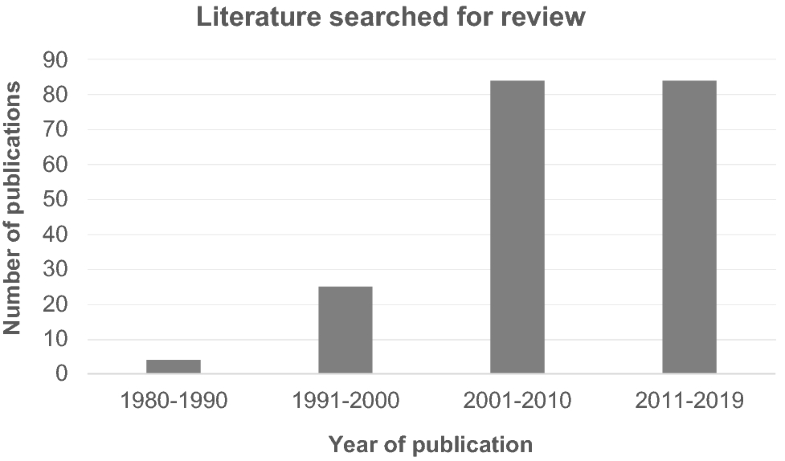 The English language databases PubMed, Google Scholar, Web of Science, and Science Direct were used to search the literature. Bibliographies of all relevant articles were also selected to find further eligible articles. The third step of classification was based on the year of publications. The literature presented in this paper was published between 1980 and 2017. However, major attention of the review is 2000 onwards in order to depict the current state-of-the-art knowledge. Figure 1 shows the frequency of articles from different decades since 1980s. The concluding step in the process was the analysis of the papers that were downloaded. Based on the analysis of these papers, they were divided into following categories by topic. The topics are: household air pollutants and their sources, major health burden, and key management procedures. Generally, biological, chemical, and physical factors such as building equipment, furnishings, heating, ventilation, and air conditioning (HVAC) systems are major household sources of air pollution. The origins, types, and concentrations of household air pollutants vary significantly from one microenvironment to another. Thus, identifying the sources of pollutants and assessing their comparative contributions can be an intricate process because of the variety of pollution sources present in the household environment; moreover, pollution sources can also vary from house to house . Many studies have attempted to identify the associations between HAP and health complications around the world. However, almost all studies focus on the health impacts of only a single or a few pollutants, and it is difficult to find an article that assesses the impacts of all household air pollutants. Thus, our focus is on filling this gap. Based on an analysis of the existing literature, sources of HAP can be classified into two main categories: (a) biological sources and (b) chemical sources. Chemical sources can be further classified into two groups: (b.1) inorganic chemical sources and (b.2) organic chemical sources. Table 1 presents a comprehensive summary of the types and sources of HAP. Comprehensive summary of the types and sources of household air pollution. In our atmosphere, biological agents are present in the form of bacteria, fungal spores, pollens, viruses, and any remains of plants and animals . Numerous studies have identified health hazards linked to these agents in different places and settings: schools , offices , child care centers , senior care centers and nursing centers , social welfare houses , bakeries and libraries , food processing units , and markets . Bacteria can easily proliferate in a building if certain moisture and temperature conditions are present . House dust mites, cats, cockroaches, and fungi are considered to be the most common sources of domestic aeroallergens [41, 42], and these are influenced by location, climate, time, and the extent of dust disturbance . Domestic mites and their feces have medical consequences because they release allergenic enzymes . Multiple aeroallergens typically coexist in a dynamic mixture of bioaerosols . Bioaerosols are airborne particles produced by living organisms . Actinomycetes and several molds are two microbial types that have been isolated and identified in soil and household air . They are both associated with moisture- and mold-damaged buildings. Environmental tobacco smoke (ETS), also known as second-hand smoke or passive smoke, has been treated as a major source of HAP around the world . In developing countries, the most prominent HAP problem is exposure to contaminants emitted from the burning of solid fuels at the time of cooking and heating . Coal has low energy efficiency, such that a huge portion of its fuel carbon is transformed into incomplete combustion products, and these incompletely burned products mainly result in carbon monoxide (CO) and particulate matter, including large amount of semi-volatile organic compounds (SVOCs) and volatile organic compounds (VOCs) [49, 50, 51, 52]. Most pollutants from solid fuels and biomass are gaseous in nature, and they can be classified into primary and secondary gaseous pollutants. VOCs (primary gaseous pollutants) are the main form of chemical pollutants; chemical materials, which are now widely used households, are able to release many toxic contaminants at room temperature . On the other hand, secondary pollutants (free radicals, aldehydes, ketones, alcohols, and fine particulate matter) result from the transformation of mixtures of pollutants as an effect of chemical reactions between ozone (O3) and unsaturated hydrocarbons . Drinking water, house dust, and paint are the most important sources of household lead pollution . In addition, lead can also be found in the soil, and it may be transported into household settings . Among the types of ionizing radiation, radon is the most important radioactive gas; it originates from rocks and soil and can concentrate in enclosed spaces such as houses . Radon gas from soil has gained recognition as the most important source of household radon [58, 59]. Similarly, building materials and groundwater are also treated as sources of radon [57, 59]. Household organic compounds are emitted from different types of materials used for building, such as vinyl tiles and floor coverings. Almost every type of product that is used by consumers can contribute to increasing household levels of VOCs and SVOCs, including paints (texanols, ethylene glycol, pinene, butoxyethoxyethanol), paint thinners (C7–C12 alkanes), paint strippers (methylene chloride), adhesives (benzene, alkyl benzenes), caulks (ketones, esters, glycols), and cleaners (2-butoxyethanol, limonene, 2-butanone). Moreover, dry-cleaned clothing (tetrachloroethylene), frying foods (acrolein, 1, 3-butadiene, PAHs), smoking (aldehydes, benzene, nicotine, PAHs), molds (sesquiterpenes), pesticides (chlorpyrifos, diazinon, dichlorvos), and showering (chloroform) all produce VOCs and SVOCs and are thus major contributors to household pollution [60, 61]. The main sources of VOCs are considered to be building and decorating materials . The concentrations of chemical organic compounds are not identical in all circumstances and may differ significantly across different settings (Table 2). HAP is considered an important environmental risk factor for human diseases around the world, as it is annually responsible for almost 5% of the global burden of disease (expressed as disability-adjusted life-years (DALYs) . Commonly observed health effects of HAP include chronic obstructive pulmonary disease (COPD), lung cancer, reduced lung function, respiratory illnesses, and weakening of the immune system, which are responsible for a significant global health burden (Table 3). The World Health Organization has stated that nearly 2.7% of the yearly global burden of disease is caused by HAP from the combustion of biomass fuel, and this form of HAP is a growing problem among the top ten global threats to public health. Women and children are the most vulnerable to HAP because they spend most of their time at home . Several studies have found that exposure to HAP from cooking results in approximately 4 million premature deaths yearly [20, 24]. Figure 2 presents a systematic diagram for understanding the effects of the household air environment on human health. Respiratory illness is the most common and widely occurring health problem resulting from HAP. Clinically diagnosed cases of acute respiratory illness showed that HAP is highly responsible for acute lower respiratory infections (ALRI) . Almost all types of household air pollutants, especially gaseous products, may cause respiratory illness. Studies have also found some respiratory effects—especially ALRI—of ultra-fine and fine particles  among children below 5 years of age [104, 105, 106]. ALRI is a leading cause of childhood morbidity and mortality in the world [107, 108]. Potential household respiratory infections can be transmitted to large numbers of people if populations aggregate in numbers higher than usual . In 2008, influenza viruses were the most opportunistic agent and were responsible for approximately 21 million ALRIs among young children . These viruses also caused 14–16% of febrile respiratory infections and were associated with 10% of pneumonia cases among children under the age of 5 years [111, 112]. There is particular concern about the growing incidence of asthma. Increased exposure to household air pollutants is potentially associated with the development of asthma . The risk of asthma is increasing due to exposures to acetaldehyde and toluene. This finding is supported by a study conducted in town and village areas. A long-term cohort study conducted on infants found that exposure to HAP, as well as the symptom of wheezing, may lead to being affected by asthma in the future . Population-based study from Sweden found that workplace ETS exposures were associated with symptomatic asthma . From these results, we may conclude that asthma—whether already developed or completely new onset—may be worsened by HAP, though the initial onset of wheezing is not directly related to HAP . In developed countries, many epidemiological studies suggest that residential dampness and molds are associated with asthma. The pooled odds ratio regarding mold exposure and asthma was 1.35 (95% CI 1.20–1.51); this result was based on studies conducted in ten different states of Eastern and Western Europe as well as Russia and North America . A study in Sweden found that concentrations of VOCs (propylene glycol and glycol ethers) in residences were 1.5 times more likely to be linked with asthma and that there was a close association between these compounds and asthma (95% CI 1.0–2.3) . In the case of children in developing countries, HAP is the most acknowledged risk factor for pneumonia, whereas in developed countries, the smoking of tobacco is the main risk factor . A study conducted in Guetemala showed that there is a relationship between the occurrence of pneumonia among children and HAP, which actually led to reduced HAP exposure . This study found that children living in homes with chimneys, compared with children living in homes with open wood fires, had significantly attenuated exposure to CO, such that exposure was reduced from 2.2 to 1.1 ppm CO, on average. Among total retrenchment in cases of exposure, almost half had a consentaneous drop in medically diagnosed pneumonia (OR 0.82, 95% CI 0.70–0.98). Epidemiological studies have verified that tuberculosis and HAP are closely related. In the 22 countries with the highest estimated burden of tuberculosis, HAP is among the most prominent risk factors, and 26.2% of tuberculosis cases are attributable to HAP (95% CI 12.4–61.0); this was estimated in a population . A nested case control study conducted by Kolappan and Subramani  found that tuberculosis was the consecutive effect of biomass use, and the adjusted odds ratio was 1.7 (95% CI 1.0–2.9). In addition, cigarette smoking plays a significant role in causing pulmonary tuberculosis. Studies have found that ETS exposures have a positive association with pulmonary tuberculosis [119, 120]. However, in the past, due to the lack of epidemiological evidence, tuberculosis (TB) was not included in the regularly cited burden of HAP . Though some previous systematic reviews did not find any effect of HAP on TB and noted the limited quality of the obtainable evidence [121, 122], there is increasingly prominent evidence of the relationship between HAP and TB. The most common phenomenon resulting from HAP is reduced lung function. Although this problem can occur in all age groups, children are at higher risk than others. Investigation among children in China showed that exposure to household coal combustion significantly reduced lung function . Well-established data suggest that chronic obstructive pulmonary disease (COPD) and chronic bronchitis can result from long-term exposure to HAP . A study showed that solid fuel use caused the development of COPD (OR 2.80, 95% CI 1.85–4.0) and chronic bronchitis (OR 2.32, 95% CI 1.92–2.80) . Cancer is a foremost cause of fatalities in the world, accounting for 8.2 million deaths in 2012 . HAP has an impact on lung cancer, upper aero-digestive tract cancer, stomach cancer, breast cancer, and cervical cancer. Among these, lung cancer is the most common consequence of HAP. The International Agency for Research on Cancer classified HAP from the burning of biomass fuel within Group 2A carcinogens, which are treated as human carcinogens . In the USA, every year approximately 3000 deaths from lung cancer are attributed to second-hand smoke, as are many cases of pediatric respiratory disease . It is estimated that almost 70% of global lung cancer deaths and approximately 20% of all types of global cancer deaths are attributable to tobacco use . Epidemiological studies suggest that respirable particulate matter (PM10), polycyclic aromatic hydrocarbons, and formaldehyde are largely associated with the increase in the incidence of human lung cancer . Experimental study among women with human papillomavirus (HPV) in Colombia stated that the probability of having cervical cancer was 5.3 times higher (95% CI 1.9–14.7) among women exposed to wood smoke from the kitchen for 16 years or more compared to women who were not exposed to such smoke . HPV infection is a significant cause of cervical cancer, where all other factors only modify the risk . In a study on urinary mutagenicity, researchers examined urinary mutagenicity levels among the employees of a charcoal plant and found that the level of exposure to wood smoke was associated with genetic damage (i.e., DNA adducts in urothelial cells) . Long-term exposure to HAP has been associated with numerous adverse health outcomes during adulthood [134, 135, 136]. Cardiovascular dysfunction, chronic bronchitis, and even DNA damage can be attributed to these exposures. One study suggests that reducing contact with HAP can improve cardiovascular health . This study revealed that high-sensitivity, C-reactive protein (marker of inflammation), 8-hydroxy-2′-deoxyguanosine (biomarker of oxidative stress and carcinogenesis, and fibrinogens, which exist in high volume during the inflammatory response phases and reduction in heart rate variability (HRV), have been demonstrated to be the precursors of myocardial infarction (MI) and are actively linked with increased levels of household air pollutant fragments. A different study showed that contact with wood smoke can increase arterial rigor and also reduce HRV . Environmental tobacco smoke, a component of HAP, is one of the most dangerous factors leading to health impairment. People who are exposed to it often suffer from immunodeficiency , endothelial dysfunction , lung dysfunction , hypertension , and atherosclerosis . A few studies have been conducted within the animal population to identify the chronic effects of ETS on human health. Prominent relationships among tobacco smoke, high blood pressure, oxidative stress, endothelial dysfunction, and cardiac remodeling were found in mouse models . Laboratory experiments in rat models showed that ETS exposure was responsible for changing the circadian rhythms of blood pressure and heart rate, pulse waves, and inactivated NO concentrations . Human exposure to particulate matter (ultra-fine and fine particles) has significant cardiovascular effects . A study among 280 women in China showed that systolic and diastolic blood pressure increased 2.2 mmHg (where 95% confidence interval was 0.8 to 3.7 and p value was 0.003) and 0.5 mmHg (where 95% confidence interval was − 0.4 to 1.3 and p value was 0.31), respectively, from the normal state with 1 − log μg/m3 increased exposure to PM2.5 . It is ascertained that HAP is associated with hypertension, and hypertension can act as an antecedent for multiple adverse cardiovascular effects. HAP—mainly from solid fuels and cigarette smoke—has been identified as a risk factor for eye diseases such as cataracts, glaucoma, corneal opacities, and trachoma, which can lead to blindness . According to the WHO, 285 million people are visually impaired—out of whom 39 million are blind—around the world . Epidemiological studies of problems associated with HAP have reported ‘ocular irritation’ as a complaint, and the contribution of HAP to this problem remains unchanged even when the symptoms start to yield [148, 149]. Epidemiological studies have also found a significant association between cataracts and cigarette smoking [150, 151], and the United States Surgeon General has claimed that there is sufficient evidence to consider smoking a major causal factor for cataracts . Naphthalene, which is found in biomass fuels, is well known for its cataractogenic capability and is used to bring about cataracts in animal models . Studies suggest that contact with a toxic metal ion (Pb, lead) is connected with protein accretion diseases such as cataracts . Age-related macular degeneration (AMD), which is associated with smoking, is also a chronic eye disease . Household air pollutants such as formaldehyde, acrolein, and particulate matter may cause oxidative stress and deflect the cytokine content of tears away from the ocular surface, which may later lead to the advancement of inflammatory dry eye disease, which is related to robust ocular pain and discomfort and may pave the way to visual disturbances [156, 157]. Many studies have been performed around the world to determine the adverse health effects of HAP on pregnancy. Stillbirth, preterm birth, and low birth weight (LBW) were commonly reported negative health outcomes of HAP. A well-documented line of research has suggested that there is a prominent relationship between in utero contact with HAP and multiple negative health outcomes [158, 159]. One study showed that women who were exposed to environmental tobacco smoke had greater chances of LBW (adjusted OR 1.36, 95% CI 0.85–2.18) and preterm birth (adjusted OR 1.27, 95% CI 0.95–1.70) compared with women who were not exposed to HAP (in cases of full-term birth) . A different meta-analysis revealed the correlation between HAP exposure and the incidence of stillbirth and LBW . From that correlation, it was shown that exposure to HAP was positively related to an increase in LBW (OR 1.38, 95% CI 1.25–1.52) and stillbirth (OR 1.51, 95% CI 1.23–1.85), both of which were related to solid fuel combustion and household air pollutants generated from other sources. Sick building syndrome (SBS) is a disease that is related to the quality of household air, which stimulates the body’s nervous system, dermis, and pulmonary system. SBS is accompanied by coughing, sneezing, headaches, dizziness, nausea, swelling and itching of skin, and irritated mucous membranes of the throat, nose, and eyes . In medicine, it is defined as a group of phenomena, not a syndrome, and its individual diagnosis is difficult . In 1983, the WHO formally addressed the concept of SBS, defining it as a set of medical symptoms reported by occupants of buildings with polluted household environments . Room temperature, relative air humidity , building dampness , ventilation flow , microbial contact (e.g., molds and bacteria), microbial volatile organic compounds (MVOC) , and volatile organic compounds (VOC)  are the household environmental issues related to sick building syndrome. An estimation of office workers around the world who worked in newly constructed or renovated buildings found that 25–30% were affected by SBS . 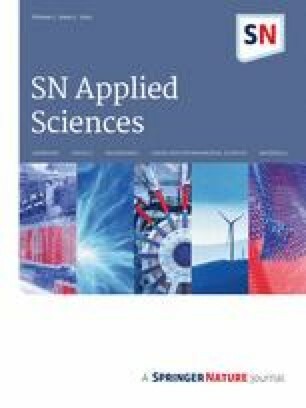 Based on the higher prevalence of sick building syndrome in older buildings, one study stated that old office buildings were more prone to SBS than new office buildings, where the occurrence of SBS was related to the levels of carbon dioxide (CO2), total volatile organic compounds (TVOC), particulate matter (PM2.5,10), and ultra-fine particles (UFP) . Legionnaires’ disease is generally a respiratory infection that causes substantial morbidity and mortality. It is often a severe form of pneumonia that is acquired by susceptible persons (e.g., elderly persons and smokers) through the inhalation of aerosols and the aspiration of water that contain legionella species [171, 172]. The most common agent of this disease is Legionnella pneumonophila, a rod-shaped bacterium that can be transmitted through any type of device—such as cooling towers, whirlpool baths, showers, and hospital equipment—that is involved in producing aerosol. The contamination of these devices has been associated with large outbreaks of Legionnaires’ disease [173, 174]. Other factors that can contribute to Legionnaires’ disease are smoking, alcohol misuse, age (especially being older), chronic cardiovascular diseases, chronic respiratory disease, diabetes, cancer (mainly intense monocytopenia, a form of leukopenia that occurs in hairy cell leukemia), and immunosuppression . People older than the age of 50 constitute 74 to 91% of Legionnaires’ disease patients, and male patients strongly predominate (1.4–4.3 males per female patient) [176, 177, 178]. Management approaches to the reduction in HAP, the control of polluting agents, the mitigation of the global health burden of diseases, and the creation of a healthy household environment can be categorized into three groups: approaches that comply with international guidelines and regulatory frameworks; approaches that reduce household air pollutants through different methods; and approaches that fulfill international environmental laws, conventions, agreements, protocols, and treaties. They are described below. Figure 1 depicts the management of HAP in a way that promotes the sustainability of good health, economic growth, and human productivity. To protect the air, we must reduce the air pollutants responsible for the deterioration of air composition and quality. Guidelines for air pollutants are mandatory to maintain better air quality as well as a healthy environment. Collaborative initiatives through international bodies such as the World Health Organization (WHO), International Council of Building Research (CIBC), private organizations such as ASHRAE (American Society of Heating, Refrigerating, and Air Conditioning Engineers), and countries such as the United States and Canada have formulated air exposure guidelines and criteria to maintain acceptable levels of air pollutants. The US Environmental Protection Agency has set standards for circumfluent air with the objective of creating a buffer to protect the health of the population. Table 4 describes the maximum average concentrations of air pollutants and the time frames that they should persist in a particular environment. Duration-based standard limits of common environmental pollutants. Three main strategies can be applied to the reduction in household pollution. Controlling the pollution source through source reduction, occlusion or substitution may be the first strategy and may help to draw attention to the source . Second, the condition of ventilation system can be improved, increasing the volume of outdoor air to reduce the concentration of household pollutants . Next, we should properly implement technologies associated with air purification or treatment. In total, a trial set of four simple recommendations to improve household air quality has been proposed : (1) reduce household emissions; (2) maintain dry and clean surfaces; (3) ventilate well; and (4) address the problem of outdoor pollution. If emission sources cannot be eliminated or reduced due to technical or financial obstacles, then air-cleaning apparatuses should be used. Air purification/treatment technologies are described briefly in Table 5. Air itself has no boundary, and pollutants disperse throughout the world. Air pollution remains a significant issue despite the many agreements, treaties, and conventions that have been designed to control it. Different environmental laws, conventions, and agreements have been proposed to ensure a clean and safe environment, but HAP management systems need to be incorporated into those policies. In the past, major laws, conventions, agreements, protocols, and treaties have been established to address outdoor air pollution. Household air pollutants are likely to be the same as outdoor air pollutants; thus, if we successfully meet the major requirements of each of these laws, conventions, agreements, protocols, and treaties, we can indirectly manage the household environment. Table 6 describes the major laws, conventions, agreements, protocols, and treaties—and their major air pollution targets—from previous decades to the present. International environmental laws, conventions, agreements, protocols and treaties related to air pollution. EPA has sponsored a series of workshops and conferences to focus the attention of the research community on quantifying intercontinental flows of air pollution. Intercontinental transport of air pollution across the Northern Hemisphere, covering ozone and its precursors, fine particles and their components and precursors, mercury, and persistent organic pollutants. Outdoor environment influences the indoor environment. Thus, transport sector is another bullet point in contributing HAP. Emissions from transport sector can be cut down by changing the transport system. Developing countries can adopt new vehicle technology, alternative fuel use, and land use policy. Furthermore, portable real-time air quality monitoring systems should be developed for different household microenvironments including schools, homes, commercial buildings, shopping centers, as well as inside various transport vehicles. To compare the overall situation and finding a suitable HAP hot spot, this could be an alternative approach. In addition, air quality forecasting model for residential environment could be a potential strategy to assess air pollution in household levels, and it might help in effective control policy formulation and decision-making [196, 197] for clarification. The mass people or public can play an effective role in air quality management plans or strategies through their engagement in surveys or public opinions, and thus, they can provide their expectations and needs. The roles of mass people could be the ‘thumbs rule’ in management strategy, especially in developing countries. To sum up, public perspective will crucial in whole management plan for any local or national government. ‘Bottom-up approach’ of implementing an educational system in every country could play a major role in raising awareness about household air quality and its impacts on health and in finding basic solutions for reducing HAP; well-known guidelines should be incorporated into educational initiatives. Activities focused on prevention and control should be accelerated, and policy and regulation systems should be up-to-date. Globally, HAP is a major public health hazard for both developing and developed nations, including large numbers of the world’s poorest, most vulnerable people. HAP may even be responsible for the highest global burden of disease. Health impacts—both mortality and morbidity—will be acute in the near future as HAP and its consequences increase daily, alongside outdoor air pollution. The greatest contribution of HAP to the burden of disease results from respiratory illness, asthma, pneumonia, lung function reduction, tuberculosis, eye diseases, pregnancy complications, cardiovascular diseases, and different forms of cancer. Children, women and elderly people are the most susceptible to this burden of disease because they spend the most time indoors. To improve their health, as well as the whole household environment, it is necessary to reduce the sources of HAP while also alleviating its adverse health effects. Although household pollutants are quite complex and vary widely in their concentrations, HAP is a modifiable risk factor with known management strategies that can be used to lessen its effects on the environment and human health. However, successful management strategies require robust information pertaining to the problem, and this information must be generated from diverse settings. Compliance with international guidelines and regulatory frameworks, pollutant source reduction methods, and fulfilling the requirements of international environmental laws, conventions, agreements, protocols, and treaties can be effective management measures to mitigate household air pollutants as well as reduce the global burden of disease. In addition to raising awareness at individual, community, national, international, and global levels through the building of partnerships, global political commitment can extenuate HAP. Based on our evaluation of the current literature, the sources and health impacts associated with HAP exposure should be considered in the development of future policies concerning reductions in all household air pollutants worldwide. Finally, this review establishes the groundwork for future studies assessing the effectiveness of strategies aimed at creating sound household environments to promote better human health.